A variety of sensors are what enable self-driving vehicles to “see”, or at least, to visualize and understand their surroundings as they move. Different manufacturers and vehicle types have different approaches and priorities as to which sensors are used, but the following sensors are used in our self-driving shuttle (a Navya Arma). In GNSS positioning, a receiver measures the transmitting time of signals emitted from four or more GNSS satellites, and these measurements are used to obtain position (i.e., spatial coordinates) and reception time. Using GNSS positioning, the vehicle can determine its position in map representation of the outside world. Lidar (also called LIDAR, LiDAR, and LADAR) is a surveying method that measures distance to a target by illuminating the target with pulsed laser light and measuring the reflected pulses with a sensor. Differences in laser return times and wavelengths can then be used to make digital 3D representations of the target. Cameras also analyze the environment of the vehicle, especially road signs and traffic lights. They also help to detect and identify obstacles. An odometer estimates and confirms the vehicle’s position and speed while moving. The inertial measurement unit (IMU) calculates the shuttle’s movements to estimate its direction, speed and position. 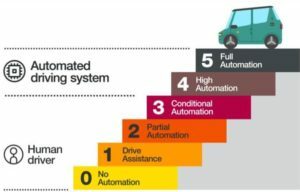 In general, it can be said that Level 1-3 deals with automation of parts of (or all) driving tasks using different driver support systems (ADAS), and that in Levels 4-5, there are autonomous systems that bear greater responsibility for driving duties. Thus, there is a significant difference between Level 3 and Level 4, both in terms of technical requirements, but also regarding the role of the user of these vehicles. The difference between Level 4 and Level 5 is that a Level 5 system can handle all types of roads, weather, situations and other conditions. 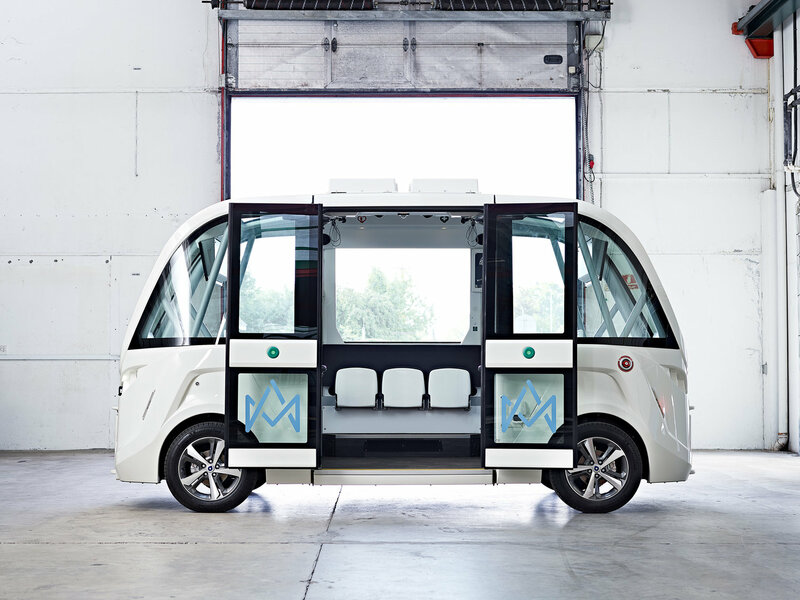 The selfdriving shuttles tested under the S3 project are examples of early vehicles with systems and sensors capable of Level 4 autonomy. However, this occurs on specifically mapped routes at lower speeds. L: 475 cm, H: 265 cm; B: 211 cm. 11 seats, about 4 standing. Approx. 100 km (8h) range. No difference in forward / reverse direction. Sensors perceive events in their surroundings and identify objects. 3D Mapping and Virtual Rails Before the shuttle can run, the desired route and its surroundings need to be created in a 3D map. This map creates a kind of virtual rail that can be used as a reference and guide while driving; Similar to how a tram can only follow its track, the self-driving shuttle can only follow the route it’s been given. This is done by slowly moving the shuttle along the planned route while scanning the surroundings with all its sensors. Afterwards, sensor data is processed manually to ensure a high quality map and a site-specific model that can be used by the shuttle.